Francesca Bortolotto Possati is the current CEO of The Bauers Hotel chain in Venice, Italy. These luxury hotels are often the top choice for someone wanting to stay in an opulent property while vacationing in Venice. But Francesca Bortolotto Possati is also a renowned female hotelier and has offered her luxurious guide to the romantic city of Venice, Italy. Francesca is an author, interior designer, foodie and a highly respected philanthropist. Her insight into Italian culture is captivating as well as her strong management skills as the CEO of The Bauers Hotel group. Her grandfather was a nearby shipbuilder and also bought and remodeled the first Bauer hotel in 1930. As CEO, Francesca has expanded the company from investment in three additional luxury hotels. They include – Bauers L’Hotel and Bauers Il Palazzo in Venice, and additionally the Bauers Palladio and lastly, the Villa F on Giudecca Island. Francesca Bortolotto Possati was featured in a Financial Times story titled, “How to Spend It – Diary of a Somebody.” She shared her thoughts on luxurious adventures and getting the most from visiting the romantic city of Venice. We hope you enjoy some of her suggestions during your next stay in Venice, Italy. Relax on the outdoor Terrace during the summer, or have a cozy cup of tea in the winter. Located on Campo San Simeon Grande, Francesca explains that this is her favorite glass of white wine within the entire Bauer complex. Only twelve minutes from Bauer l’Hotel, this outdoor market is bustling with life and culture, “the market is an explosion of color, sights and smells.” Francesca says. Be sure to arrive before noon to see best selection of fresh fish and produce labeled with their place of origin—almost always from local islands and surrounding countryside. Soaps that tell an interesting story: Francesca opened this cosmetic laboratory to make soaps, perfumes, and local cosmetics. The Basilica is part of a rehabilitation program for women in the local jail – helping them acquire a beneficial skill set at the crossroads of science and beauty. Located down the street from Bauer l’Hotel, this 100% Made In Italy exclusive household linens company focuses on providing exceptional linens for customer’s homes, yachts, and private jets. The company has an extensive history of high-end clientele, including royalty, and continues to maintain its promise of excellence through meticulous attention to detail and flawless craftsmanship. Pick up something to take back home after your stay in Venice. Just a four-minute walk from the Bauer l’Hotel, this restaurant overlooks St. Mark’s Square. A quintet in the background softly accompanies your dining experience. As Francesca writes, this is one of “Venice’s chicest Michelin-starred restaurant. It is an elegant and intimate restaurant with the most impeccable service.” Ingredients are locally chosen from the Rialtro Market daily. A day excursion about an hour from the hotel, and home to the famous Burano lace, this island features brightly colored homes that reflect into the surrounding water channels. Walking alongside these neon houses, visitors will feel like they are within a piece of art. 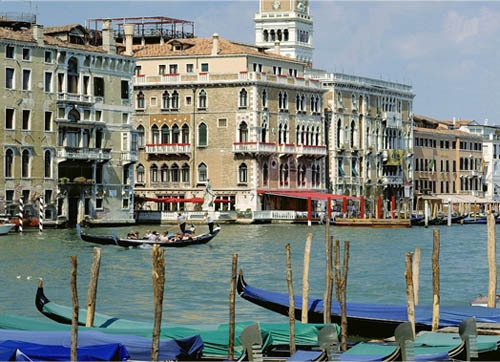 Has it been your dream to visit the romantic city of Venice, Italy? Let The Life of Luxury plan and book your entire itinerary. We are luxury travel specialists and you can read more travel destination stories by following our popular luxury blog.